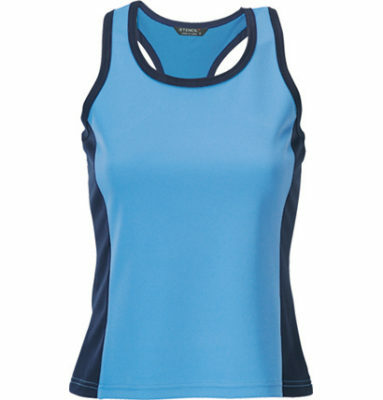 The Women’s branded Cool Dry Singlet is a comfortable and easy to wear choice for sporting associations looking for their next uniform or for businesses looking to promote their participation in charity or sporting events. These singlets are also a good option to add to your promotional merchandise range at your next community, music or sporting event, or to update your summer merchandise for your business. Available in sizes 8 – 18, these singlets feature a curved hem, and contrast colour panels on the sides and shoulder and neck seams. With four great colour options, the Women’s Cool Dry Singlet looks great with a screen printed logo or branding message, and will help your team or business stand out. Team up the Women’s promotional Cool Dry Singlet with the men’s version for an all-round cohesive look for your sporting association, team or your next business charity day. Made from 185g Cool Dry, the Cool Dry Singlet is styled to fit and easy to wear. It features a curved hem and contrast panels on both sides and neckline.